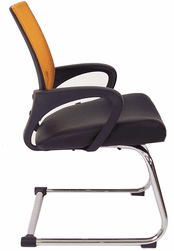 The Contempo guest chair adds a touch of glamour to any office setting. 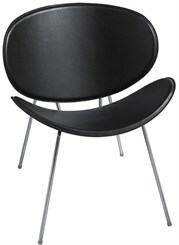 Designed with a curved back and seat to maximize comfort. Contempo will help you slow down and enjoy a luxurious seating experience. The flowing curves add distinct style to any workspace setting while allowing this guest chair to be used in any casual corner to the corner office. To perfectly accent Contempo's stunning design, the frame is made from solid steel rod with a chrome finish. Seat Size: 16"W x 25"D. Back Size: 16"W x 25"D. Seat Height:	16". Measures 25-1/4"W x 25-3/4"D x 29-1/2"H overall. Shpg. wt. 20 lbs. PRICE INCLUDES FREIGHT! Please allow 1-2 weeks for delivery.